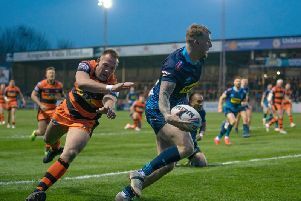 As Dom Manfredi's devastating setback was absorbed, Wigan coach Adrian Lam has been left to assess more concerns on the injury front. Halfback Jarrod Sammut, who also suffered a knee problem in Friday's 38-28 loss at Castleford, faces a spell out of action. He has suffered ligament damage and will be sidelined for at least four weeks. Forward Joe Greenwood also left the action early with a head knock and will miss Friday's trip to Wakefield. He will need to pass concussion protocols before he is allowed to return and will be assessed on a week-to-week basis. Tom Davies would appear the obvious candidate to replace Manfredi on the right wing. Jake Shorrocks could get a run at his preferred role at half-back in place of Sammut - though Sam Powell is nearing a return to fitness after an ankle injury.